Had a look at our just-launched ship, Lego Carnival Vista? Pretty nice, right? 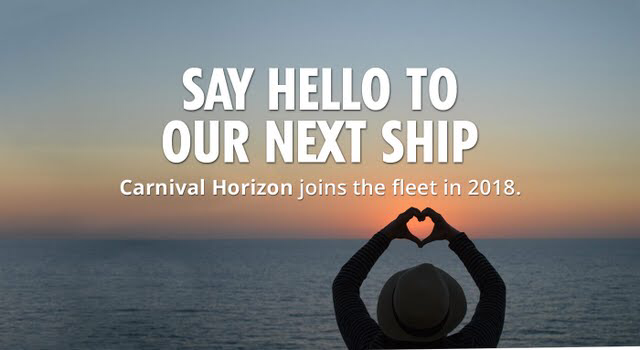 As a sister ship, Lego Carnival Horizon will have many of the features delighting guests today — like SkyRide, Havana Bar and IMAX, for starters — with further evolutions of Lego Carnival Vista’s dynamic spaces and signature ocean views to come. Unlimited fun is getting a little more unlimited. Lego Carnival Horizon is being built now in Italy. She’s scheduled to make her maiden voyage in early 2018. Look to Lego Carnival Horizon for a fresh perspective on how much further we can take vacation. "The Future of Fun in the Making!"